3D colloidal crystal in a nematic liquid crystal Scientists at the Institute of Physics, together with colleagues from the Institute of Stephen I. (Ljubljana, Slovenia) first built a three-dimensional colloidal crystal in the nematic liquid crystal. Three-dimensional colloidal crystal in nematic liquid crystals:a)the final assembly stage of the two colloidal crystal smaller crystals (top view)b)dimensional reconstruction location of colloidal crystal particles of the data obtained by confocal microscope and a schematic view of one crystal plane. Until recently most impetus for this liquid crystal was its use in a display device. However, despite significant progress in physics, chemistry, and liquid crystal technology, intensive search continues, but the focus has shifted more and more towards complex heterogeneous systems, in which the liquid crystal is only one component. One of the brightest and most promising examples of such systems is a colloidal dispersion of liquid crystal — a system consisting of particles dispersed in a liquid crystal matrix. Typically, the elongated molecules of the liquid crystal nematichnogo trying to orient parallel to one another, whereby a liquid crystal a long molecular orientational order and the anisotropy of the elastic, optical, dielectric properties. Therefore, the colloidal particles, which define the orientation of liquid crystal molecules is perpendicular to their surface, may be accompanied by a point topological defect dipole at a topological form nematic liquid crystal. These dipoles interact like electrostatic dipoles and this forward-looking elastic interaction is strong and anisotropic and can stabilize periodic lattices of colloidal particles. But for a long time, the interaction between the particles and pattern formation in liquid crystals was studied primarily in two-dimensional systems, and three-dimensional colloidal LCD lattice were only about "the object of theoretical calculations. 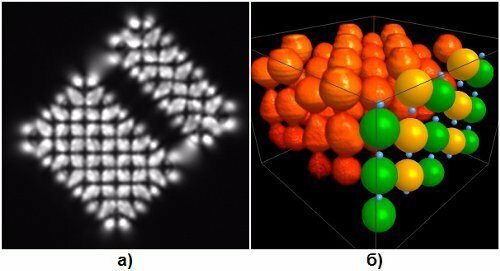 The authors of the publication[A. Nych, U. Ognysta, M. Skarabot, M. Ravnik, S. Zumer, I. Musevic,Nature Communications, Vol.4, 1489 (2013)]was the first to experimentally constructed using three-dimensional laser tweezers dipole colloidal crystal formed by 4 micron spherical silica particles in the liquid crystal matrix. Fluorescent confocal microscopy confirmed that the crystal has a tetragonal symmetry and is formed from antiparallel topological dipoles.The authors showed that this crystal can be controlled by an external electric field— Three-dimensional colloidal crystal is compressed with the proviso that the dielectric constant anisotropy of the liquid crystal matrix is positive, and liquid crystals with negative dielectric anisotropy, application of an electric field causes reverse rotation of the colloidal crystal as a whole.